Since buying my Kindle, I’ve been primarily filling it up with older, somewhat hard to find books. Solomon’s Vineyard and Fast One did not disappoint. 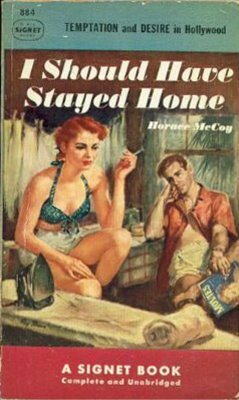 Nor did Horace McCoy’s brief and brutal I Should Have Stayed Home. McCoy, a journalist and Black Mask writer, moved to Los Angeles in 1930 with hopes of becoming an actor. He would instead become a screenwriter. But the cattle call experience marked his work, especially his best known novel, They Shoot Horses, Don’t They?, about Hollywood aspirants participating in a grueling dance marathon, and I Should Have Stayed Home. Georgia-born Ralph Carston headed west with dreams of stardom, but he finds himself short of cash, scuffling for extra work, and sharing a seedy bungalow with his Platonic roommate Mona Matthews. A friend of Mona’s is arrested for shoplifting. A chain of circumstance follows that brings Ralph in contact with an older woman who has designs on him, a disillusioned flack, and a host of other Tinseltown types. It’s a grim, powerful book. Ralph seethes with desperation and rage. He’s implied in his letters to his mother that he’s already made it in Hollywood, but he soon learns that his accent and his attitude may keep him from success. Scarier is the resentment boiling over into hatred that he feels toward those who have managed to grab the brass ring. (“It made me sore, sitting here looking at Robert Taylor, the biggest star in the pictures, trying to figure out what he had that put him where he was and that, goddam it, one of these days ...”) It’s an unsparing look at the dark reality of show business that deserves to be mentioned alongside Nathanael West’s The Day of the Locust.